The latest release of the ccMiner 1.7 fork by tpruvot (source) has added some new interesting functionality among which is the ability to run a benchmark on all of the supported crypto algorithms by the software. There is no more need to go through all of the algorithms one by one and record the returned results, all you have to do is run ccminer.exe --benchmark and the miner will go through all of the algorithms automatically and print out the hashrate you get with your particular Nvidia GPU. It can work with single and multiple GPUs in the system, but if you have more than one and you do not specify which one you want tested it will benchmark all of them and display individual hashrate. 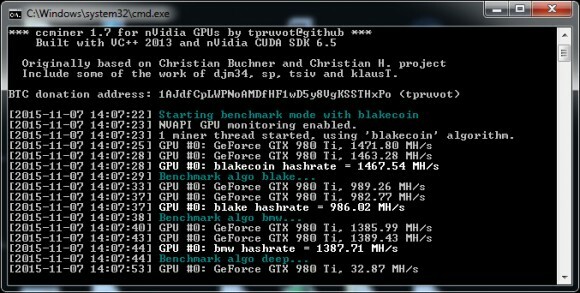 Thanks to the ease of use of this feature and the fact that it needs just about 5 minutes to run we might soon start seeing crypto hashrate benchmarks included in Nvidia GPU reviews on sites that do hardware reviews, but generally do not bother to test crypto mining performance. [2015-11-07 14:08:41] NVAPI GPU monitoring enabled. [2015-11-07 14:08:41] 1 miner thread started, using 'blakecoin' algorithm. [2015-11-07 14:13:55] blakecoin : 1459369.4 kH/s, 1 MB, 4194304 thr. [2015-11-07 14:13:55] blake : 970336.8 kH/s, 1 MB, 4194304 thr. [2015-11-07 14:13:55] bmw : 1354822.5 kH/s, 65 MB, 2097152 thr. [2015-11-07 14:13:55] deep : 32154.5 kH/s, 33 MB, 524288 thr. [2015-11-07 14:13:55] fresh : 11745.7 kH/s, 609 MB, 524288 thr. [2015-11-07 14:13:55] fugue256 : 367203.5 kH/s, 129 MB, 4194304 thr. [2015-11-07 14:13:55] groestl : 30076.7 kH/s, 1 MB, 524288 thr. [2015-11-07 14:13:55] heavy : 30115.6 kH/s, 147 MB, 524032 thr. [2015-11-07 14:13:55] keccak : 384901.8 kH/s, 129 MB, 2097152 thr. [2015-11-07 14:13:55] jackpot : 6293.4 kH/s, 106 MB, 1048576 thr. [2015-11-07 14:13:55] luffa : 6417996.4 kH/s, 129 MB, 2097152 thr. [2015-11-07 14:13:55] lyra2 : 1073.3 kH/s, 515 MB, 65536 thr. [2015-11-07 14:13:55] lyra2v2 : 12163.3 kH/s, 393 MB, 262144 thr. [2015-11-07 14:13:55] myr-gr : 42708.4 kH/s, 9 MB, 131072 thr. [2015-11-07 14:13:55] neoscrypt : 645.5 kH/s, 261 MB, 8192 thr. [2015-11-07 14:13:55] nist5 : 21525.5 kH/s, 65 MB, 1048576 thr. [2015-11-07 14:13:55] penta : 13701.2 kH/s, 33 MB, 524288 thr. [2015-11-07 14:13:55] quark : 14678.7 kH/s, 86 MB, 1048576 thr. [2015-11-07 14:13:55] qubit : 15453.1 kH/s, 609 MB, 524288 thr. [2015-11-07 14:13:55] skein : 323525.3 kH/s, 1 MB, 1048576 thr. [2015-11-07 14:13:55] skein2 : 213998.6 kH/s, 33 MB, 524288 thr. [2015-11-07 14:13:55] s3 : 28802.4 kH/s, 609 MB, 524288 thr. [2015-11-07 14:13:55] x11 : 9674.1 kH/s, 609 MB, 524288 thr. [2015-11-07 14:13:55] x13 : 8073.4 kH/s, 609 MB, 524288 thr. [2015-11-07 14:13:55] x14 : 8029.6 kH/s, 609 MB, 524288 thr. [2015-11-07 14:13:55] x15 : 7092.7 kH/s, 609 MB, 524288 thr. [2015-11-07 14:13:55] x17 : 6520.5 kH/s, 609 MB, 524288 thr. [2015-11-07 14:13:55] whirlpool : 17056.7 kH/s, 33 MB, 524288 thr. [2015-11-07 14:13:55] whirlpoolx : 244812.1 kH/s, 65 MB, 1048576 thr. [2015-11-07 14:13:55] zr5 : 1960.7 kH/s, 84 MB, 262144 thr.